Wait is the generic interface, which makes selenium to wait for particular time with associated event. Events like element to be click-able, element to present. Wait interface present under org.openqa.selenium.support.ui package, FluentWait and WebdriverWait implements Wait interface. until is a abstract method present in Wait interface, whichever driver implements Webdriver the also must implement Wait interface. Which means browser classes (FirefxDriver, ChromeDriver...) must implement methods present in Wait and Webdriver interfaces. until method accepts a ExpectedConditions values as parameter, class must wait till the given condition neither becomes null nor false when they implement until method. So until methods implementation must not have return type as void. 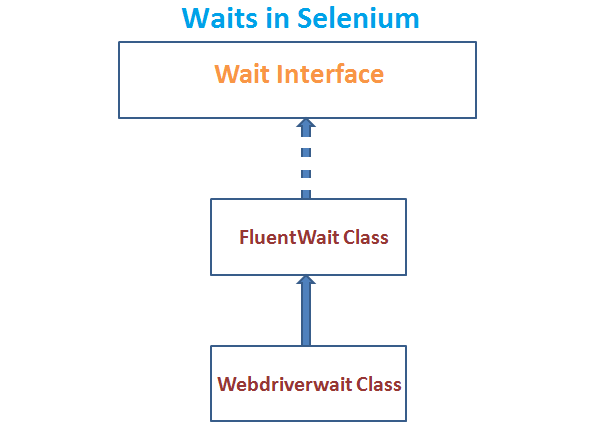 FluentWait class implements Wait Interface and WebdriverWait class extends FluentWait class, this is called as multi-level inheritance in java. User can configure the frequency with which to check the condition. User may configure the FluentWait to ignore specific types of exceptions whilst waiting for the condition. These are the methods present in the FluentWait, we may not use all of the methods in our practical use, but we can use use it reap the maximum benefit. This method set the time limit for Fluent wait i.e how much time to wait for an condition when Fluent wait is used. withTimeout method accepts two parameter first parameter is amount of time, and second parameter is what is the TimeUnit for tha amount of time. TimeUnit could be from Nano-seconds to Days. ignores a list of exceptions that occur during the wait time, we have to pass Collection type parameter to this method, collection type could be List, Set, Queue. given string message will be displayed at the final exception. timeoutException is protected method of the FluentWait class, we have to override this method to raise our own messages. until method recursively calls ( calls the self i.e same function ) its input value to the given function until the function returns neither null nor false based on the the polling interval, until method throws exception if the method returns a null or false after the time limit. until methods in FluentWait gets terminated on below scenarios. If you keenly notice .until() method in the accepts Function Interface type or Predicate Interface type. Function Interface helps user to implement their own implementation for the apply method, which is nothing but what kind of operation you want to perform like check whether a element present, check whether alert present, check whether title is changed so on..
Function interface is generic Interface and it is represented as Function<T,R> where T is the type of object passed to apply method and R is the type of object returned by the apply function. If we are implementing Function interface, we must provide implementation for the abstract apply() method present in the Function Interface. Function can return any value, that we mentioned in the Function interface generic. T apply method's parameter type and it could be WebDriver, WebElement, String, basically it could be anything..
R apply method's return type and it could be WebDriver, WebElement, String, basically it could be anything..
1. We are accepting WebDriver type parameter to the apply method and returning WebElement type object. Predicate interface is almost same as Function Interface, the only difference is Predicate return only boolean Object where as Function Interface returns any value. Predicate Interface accepts generic type as parameter (any value), We have to implement the test() method from the Predicate Interface. T is the Generic and it could be anything, like WebElement, Webdriver, String or anything..
Below example checks Whether the given page title is 'Google' or not and it waits till the page title becomes 'Google', when the test method return 'false' the same test method will be recalled, till return value becomes true or the time limit reaches. We can pass static and non static methods to the until, until method calls these methods until the methods returns neither false nor null. 2. Create a static method waitTillURLContains, this method will be used by FluentWait to wait till URL contains particular String or till time expires. 3. waitTillURLContains accept only Webdriver parameter. 4. Write condition to check if the URL contains doodle string, return true if it contains otherwise return false. 5. Create the browser object and navigate to the google page. 6. Create object for FluentWait and register the polling time(10 seconds) and the total timeout(60 seconds). 8. Call the waitTillURLContains method to check whether URL contains 'doodle' or not. We know that until method recalls the given method repeatedly with polling frequency till it receives true or not null object from the given function. 9. If you notice on above program we have used :: to call a method. We normally use class name(CustomFluent) . (dot) method name for the methods, for static method we use ClassName.MethodName(), for non-static methods we use classObject.MethodName(). When we use . (dot) notation, the method returns exact return type. When we call a method using ::, method doesnot explicitly return any type, during runtime the return type is decided. 1. Create browser instance/object and navigate to Url. 6. Implement Function interface with until method, we can also implement predicate in until method. Please refer Function and Predicate Section for more details about them. 7. Return the WebElement (Feeling Lucky Button ) from the apply button. In this, we are going to learn what happens when fluent wait failure occurs, lets modify above program. 2. Create Fluent Wait object and set the polling time and ignore. Please refer above image for number details. with 5 SECONDS interval shows the frequency of polling, we have 5 seconds frequency for 30 seconds which means it tried for 6 times along with default time, at 0'th moment fluent wait tries to find the element but if element is not present, it tries after 5 seconds(for 6 times), so there will be 7 attempts, Because of which there 7 polling statements.